The West Side Spirit’s Emily Higginbotham weighs in on the City’s notice to revoke permits for 36 West 66th Street. Acknowledging that this is just “one of the latest Manhattan projects to face opposition from land-use advocates and local residents” she delves into the impact such a development would have on the context of the neighborhood. With supportive commentary from Manhattan Borough President Gale Brewer and District 6 Council Member Helen Rosenthal, Higginbotham quotes LANDMARK WEST! executive director Sean Khorsandi ‘the limits have never been pushed like this’ and reached for comment today, he adds ‘and neither has the community’. 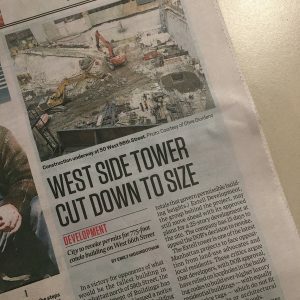 Stay tuned to LANDMARK WEST!’s coverage of 36 West 66th Street and read the full West Side Spirit article HERE.